Just give me those 4 sides and I don’t really care what kind of meat you’re serving – it’s all good! This mac & cheese is rich and creamy with a velvety cheese sauce made from 5 cheeses, heavy whipping cream and eggs. For a really creamy mac & cheese, you can leave out the eggs so it doesn’t set up as much. Soul good! Add 2 c. each of milk, half and half and heavy whipping cream to a 4 qt sauce pan on low heat. Add 2 cup of original velvetta cubes and 2 c. of sharp velvetta, 2 c. sharp cheddar, 1 c. parmesan and ⅛ c. asiago to warming liquid. Pour cooked, drained macaroni into a large aluminum bowl. 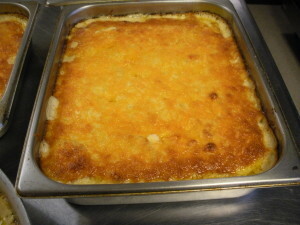 Add 1 cup of shredded cheddar cheese and 1 cup each of velvetta cubes, ½ c parmesan to bowl of macaroni and toss to mix. Add ⅛ c melted butter, salt and pepper and onion powder. 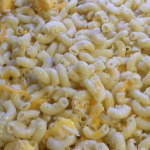 Toss macaroni to distribute ingredients throughout. When cheese in pan has melted completely in the warming milk, add tempered, beaten eggs (optional) to cheese sauce. Spread remaining ⅛ c. melted butter in bottom of baking pan. Pour macaroni mixture into pan. 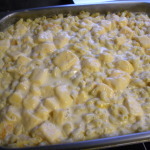 Pour cheese sauce over macaroni mixture in baking pan until sauce reaches top of macaroni. 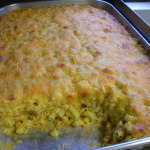 Sprinkle top of dish with mixture of ½ c parmesan, ⅛ c asiago, 1 c shredded sharp cheddar) and bake at 350 for 45 minutes to an hour, until set or until temp reaches 165 degrees on food thermometer, and has a golden brown crust. I made eggs optional for this reason. 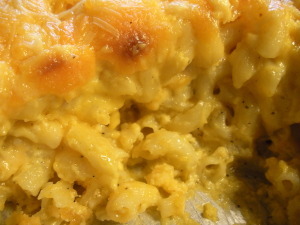 If you add the eggs you will have more of an old school baked mac & cheese dish. Without the eggs, your mac & cheese will be creamier because the eggs aren't there to make it bind together as much.